February 14th 1984; following the death of Yuri Andropov four days earlier, Konstantin Chernenko takes over as the general secretary of the Soviet Communist Party, the ruling position in the Soviet Union. Chernenko was the last of the Russian communist "hard-liners" prior to the ascension to power of the reform-minded Mikhail Gorbachev in 1985. 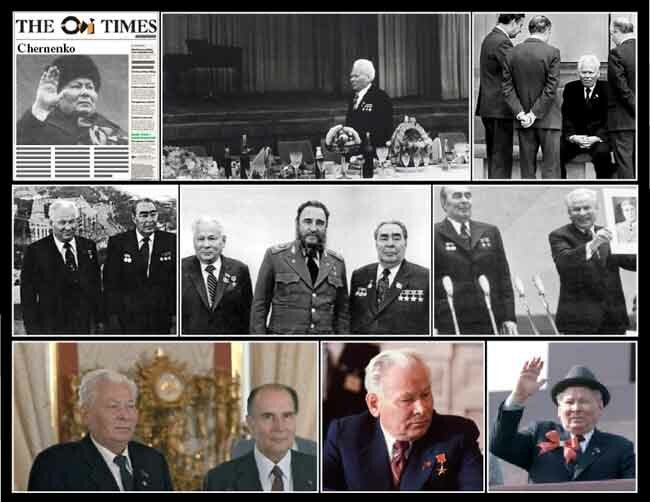 Chernenko's brief rule was characterized by a return to the hard-line policies of Brezhnev. He pulled back from supporting the few economic and political reforms instituted by Andropov. Russian foreign policy took on a harsher tone, and the Soviets retaliated for the U.S. boycott of the 1980 Olympic Games held in Moscow by refusing to attend the 1984 summer games in Los Angeles. Declining health during the last several months of his rule, however, prevented Chernenko from making much of an impression either domestically or internationally. When he died on March 10, 1985, Mikhail Gorbachev took power and began his program of dramatic economic reforms and his efforts at improving relations with the United States, which led to the eventual dissolution of the Soviet Union in 1991.